Well, I finally got to leave the Dallas airport on Tuesday evening around 5 to board a plane headed straight for anchorage! And let me tell you a six hour flight and not on the top of my fun list! I ended up having a middle seat and very little elbow room. Just par for the course I guess. And as I was sitting on the plane, settling in, that's when the real fun began. 4 hours of turbulence. And I don't mean "that was like a bump in the road" but "I can't hold my book still" turbulence. They even stopped the drink service because the drinks were sloshing on people. Finally arrived to anchorage about 8:45 (11:35 Nashville time), grabbed my bags and high-tailed it to my next and last flight at 10:00. This is what greeted me at the gate. 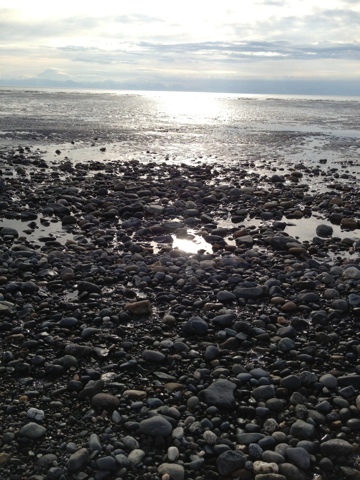 On seeing that, I wondered if I was better off on the ground in anchorage. I was thinking the plane might be remote control, by the looks of it. But, I had made it this far so I strapped on my big girls pants and boarded. 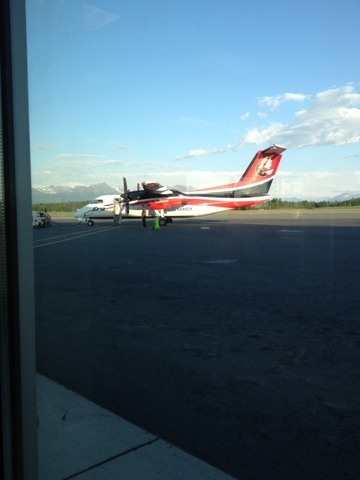 25 mins later I landed in Kenai (thankfully) at about 10:30 (1:30am Nashville time). Got to see some familiar faces and see the beautiful Alaskan landscapes (including a moose hanging out by the road) on the way to their house. In my room, they had put together this welcome basket. They are seriously the most thoughtful and generous friends! 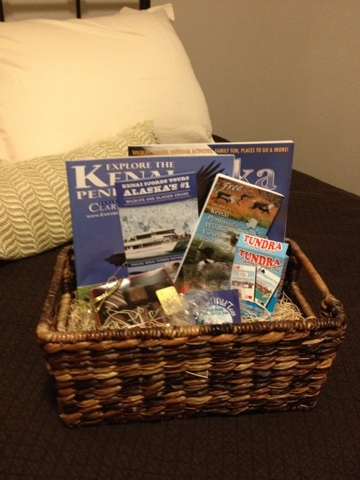 The basket included brochures of what we will be doing, Alaskan chocolates (do they know me or what?!? ), Alaskan tea and Alaskan playing cards. Love it! Thought I would be heading straight to bed, but catching up with Clint and Kristina gave me a second wind (or maybe third or fourth at that point). We watched the sun go down around 12:30 and turned in shortly after. All in all, the ending of the day made the trip totally worth it! After sleeping in, we spent the day riding around town, seeing different parts it the town including the doctors office they had set up as an allergy clinic. 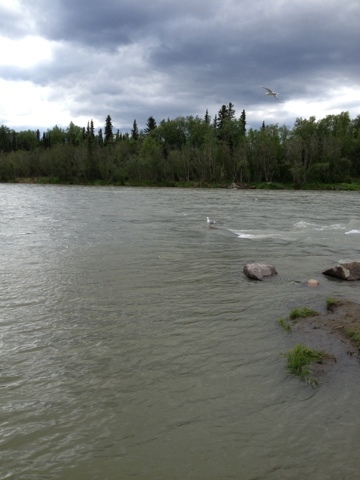 Also took a picnic lunch to the park by the Kenai river. So peaceful. Visited their church that night and enjoyed some delicious ribs made by a couple who summer here and park their camper behind the church. Such an interesting culture and super kind people. 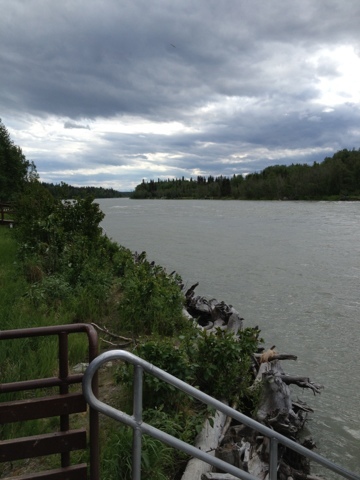 After church, we went "moose-looking" to no avail, but got to see some great parks and trails. And of course... 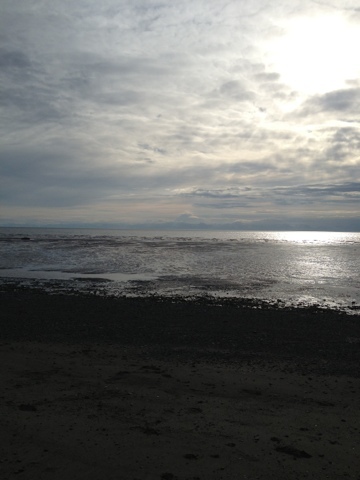 THE BEACH!